Body Transformation: Michael Shilkus Torched 300 Pounds! The average scale couldn't measure Michael's weight and doctors feared for his life. See how this fighter lost 300 pounds with sheer will and determination! I was fat as a small child and was always the biggest kid in my class. I was so fat as a kid even Santa made fun of me. I sat on his lap and he asked if I had rocks in my pants because I was so heavy. The funny thing about it was that I never thought being fat was bad. I came from a family of fat people, a community built on a corn-fed, Iowa-bred mentality. Being fat was a way of life. A typical day of eating then was insane. I used to wake up around 3 p.m. and take care of my grandparents, which meant 3 p.m. was dinner time. I made one steak for my grandma, one for my grandpa, and four for me with two bags of French fries. Two hours later, I was hungry again and went to McDonalds to order four double cheeseburgers, two large fries, and a large diet coke. Before going to work at midnight, I stopped at Taco John's for six tacos and a pound of tater tots. After work, I went home, watched television, and ate three packages of ramen noodles. I suffered from depression, suicidal thoughts, and loneliness while living in a house full of people. It's hard to imagine, but you can be lonely when surrounded by others. I believed that nobody knew how I felt. I surrounded myself with distractions, television, Internet, video games, and sedentary activities. No scale could weigh me. When I went to the doctor, I had to stand on two separate scales. I was embarrassed to admit I had a problem. I couldn't get past my pride to get help. Doctors tried to tell me to cut my portions down and exercise, but that seemed too easy. Gastric bypass was an option up until I weighed the pros and cons and decided it wasn't for me. I was lost inside myself. At age 25, I met my wife. Before her, I had no backbone. I walked around with my head hung low and had no friends. With her support, I started to change my life for the better on the outside and inside. At first, all I did was watch what I ate, count calories, and read labels. I began by cutting meat from my diet to teach me self control and that there was more to life than meat. I thought I could become a vegetarian and can say that it helped me control portions, but I was never happier than the day I got to eat meat again. I went three months this way and lost 60 pounds. When I finally got my eating under control, I started exercising. When I first started, I hated it. It's embarrassing to get on a treadmill weighing what I did, go for 10 minutes, and have to get off. Just 25 minutes of walking was enough to soak the treadmill. It took me a long time to get up the courage to go to the weight area. The sound of clanging metal and grunting scared me. "To tighten my loose skin and accomplish my goals without surgery, I learned to eat properly." I became a cardio freak and went from obese to anorexic. I went from more than 500 to 193 pounds of skin and bones. My lack of eating became a fight between my wife and I, so I got into fitness. I realized that my body was built for muscle. To tighten my loose skin and accomplish my goals without surgery, I learned to eat properly. Through this journey, I decided to become a personal trainer and help others succeed. I find joy in helping the overweight overcome obesity. I credit my success to my belief in Jesus and my wife. My family didn't take my weight loss well in the beginning. They thought the backbone I gained made me a jerk. My grandma, God bless her, told me after losing 30 pounds to stop because I lost enough. A couple of years after I lost the weight, I had business cards made with my progress photos on the back and gave one to my grandma. As she looked at the card I asked her, "Was it really baby fat, grandma?" She cried as she looked at the picture. I don't think she realized how big I really was. "My biggest goal is to take future pictures with my shirt off because it's my insecurity." The most challenging part for me was stepping away from the scale and realizing that I needed to eat more to gain muscle. I'm always striving to be better. I want to get my deadlift to 400 pounds by the end of the year. I want to help others succeed at their goals. When people see me in the gym killing it, it makes them strive to do better. My biggest goal is to take future pictures with my shirt off because it's my insecurity. Eat small portions more frequently. Anything is possible with determination and the will to succeed. Find someone who can motivate you. Bodybuilding.com helped me with numerous articles on every subject under the sun. If you can't find it here, you won't find it. Ordering from the store is great because the shipping is speedy. My order is at my door within 2-3 days. BodySpace has been an inspiration. When I see others succeed, it makes me want to do better. The community is great. Everyone is there to help and motivate each other. 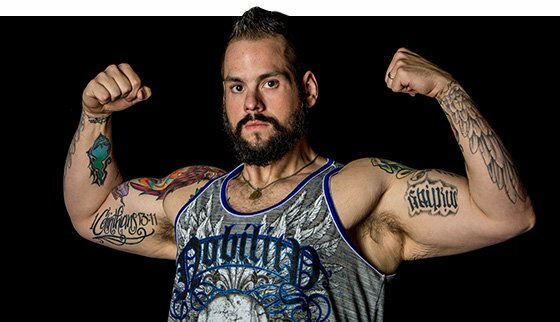 I'm a huge Kris Gethin fan. I followed his DTP program and had huge success with it.